This is very interesting and it goes to show that where there is a will there is a way. The aircraft can fly without a single drop of fuel. It is powered by the sun. Each of the motors on the carbon-fiber craft charges 400-kilogramme (880-pound) lithium polymer batteries during the day, allowing the aircraft to carry on flying after dark. 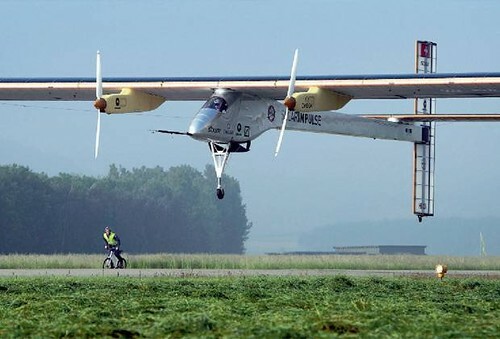 The Swiss solar-powered aircraft takes off on 24 May 012 in Payerne and travel through Madrid , destined for Rabat in Morocco. AFP photo. The Solar Impulse plane, a giant as big as an Airbus A340 but as light as an average family car, is piloted by Bertrand Piccard, 54-year-old psychiatrist and balloonist, on the daring voyage from Europe to Africa. As Piccard guided the experimental plane almost silently aloft from Madrid-Barajas airport at 5:22 am (0322 GMT), a red light could be seen disappearing into the moon-lit sky. An onboard camera relayed pictures of the Spanish capital's quiet streets stretched out below the aircraft, which has 12,000 solar cells in the wings turning four electrical motors. Helped by a tailwind, Piccard gradually piloted the plane towards 3,600 metres (11,800 feet) as he headed to Seville in southern Spain. He was then to cross the Gibraltar Strait at 8,500 metres (28,000 feet), enter Moroccan airspace over Tangiers and land in Rabat-Sale some time after 11 pm (2200 GMT). Piccard, who made the world's first non-stop round-the-world balloon flight in 1999 together with Briton Brian Jones, took over the controls from project co-founder Andre Borschberg, a 59-year-old Swiss executive and pilot. Borschberg flew a first leg from Payerne in Switzerland, landing in Madrid on May 25. Organisers said the trip, 2,500 kilometres (1,550 miles) overall, is timed to coincide with the launch of construction on the largest ever solar thermal plant in Morocco's southern Ouarzazate region. The voyage also is intended as a rehearsal for the plane's round-the-world flight planned for 2014. The aircraft made history in July 2010 as the first manned plane to fly around the clock on the sun's energy. The Green Mechanics: Very interesting prospect if you are an investor. Inspiring, if you are an inventor. Motivating, if you like learning new things. Thanks for this given information. I am still waiting for your next best blog.